When devising this plan, my main goal was two-fold: to keep it simple and to be realistic. I really believe in playing to your strengths rather than fighting against your weaknesses, and when it comes to dieting, that translates to: it’s better to work within the realm of your taste preferences than to struggle to avoid them by forcing yourself to adapt to an eating style that’s less enjoyable. Not only will it be easier to adjust, but you’ll be much more likely to stick with a plan that you feel naturally suits you. 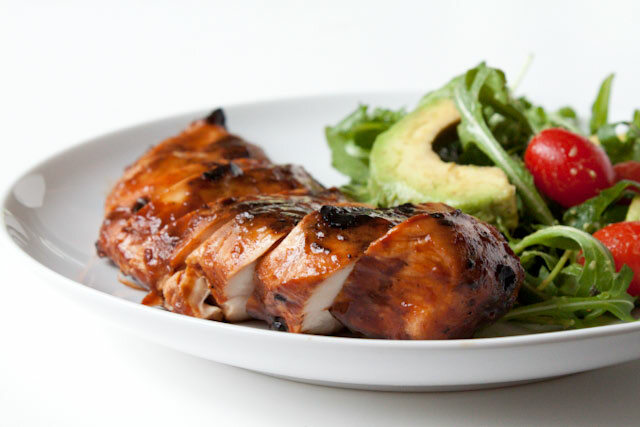 Too often, I read diet plans that include recipes requiring a great deal of fuss—from the lengthy prep and cook time to the [sometimes pricey] ingredients that I wouldn’t ordinarily stock in my pantry. These are the plans that necessitate a complete overhaul of my kitchen and my palate before I even get started. That won’t work here. Not for me and not for Mom, who works two jobs six days a week. I wanted to avoid the fuss factor and instead, take a more realistic approach to meal planning. Now, knowing Mom’s unique eating style, I was able to tailor this diet specifically to her. The hardest part? She’s a very picky eater. And as her switched-at-birth-daughter—someone who considers herself a wildly adventurous eater— it’s quite the challenge. The lists below are but a fraction of Mom’s likes and dislikes. I joke, but truthfully, I respect her preferences; I have them, too (like: marshmallow fluff, dislike: mackerel). My aim will be to incorporate her likes into the plan as much as I can, while helping her to discover new foods she might enjoy as well. 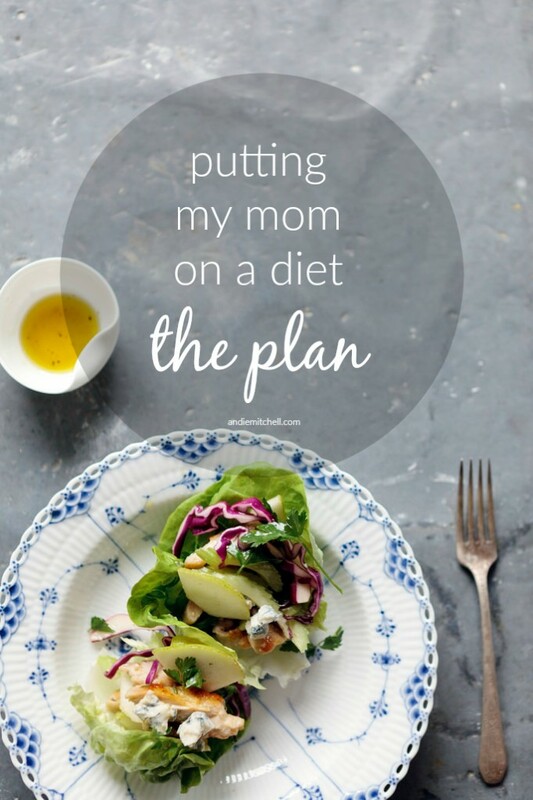 Another unique aspect of this diet is that I do not intend to simply provide Mom with a meal plan and say, “Here. Go. Make. Lose.” I aim to teach her something in the process, as lofty as that sounds. About calories, about portions, about balance. I don’t want her to master the preparation of a set of meals and feel married to that particular batch of recipes for their magical weight loss effects; I want her to come to understand why I’d prescribed them in the first place. I want her to learn how to nutritionally structure a meal on her own, and to begin to believe that there is indeed a much-loved place for White’s Bakery cake in a healthy life at a healthy weight. I ask myself, when this is “over,” what do I want her to be left with? 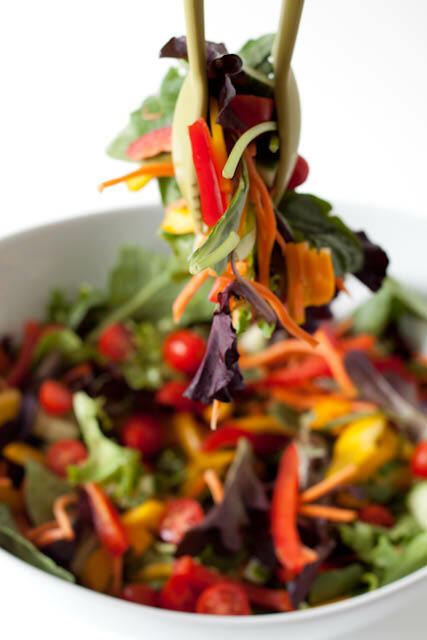 Other than a focus on eating as many fruits and vegetables as possible and creating a caloric deficit, this diet places no restriction on meats, grains, or dairy. I do want Mom to focus on eating as many real, whole foods as possible, but I also understand that there are many foods that she loves that are highly processed and less than natural; this is fine. Similarly, Mom isn’t someone who wants to make her own dressings for salads, so I’ve worked with her to find brands and flavors that she likes—these, too, will not always be the most wholesome of options, but they may be the best for her right now as she transitions into healthy eating. As long as she’s doing her best to consume all things in moderation, I consider it a success. This means that Mom must eat 1887 calories per day in order to maintain her current weight. Now, since she’d like to lose weight, she needs to consume fewer than 1887 calories per day in order to create an energy deficit (where the body burns more than it takes in). To lose roughly 1 pound a week, she’d need to cut her daily intake by 500 calories since 1 pound is equal to 3500 calories (7 days x 500 calorie deficit per day = 3500). 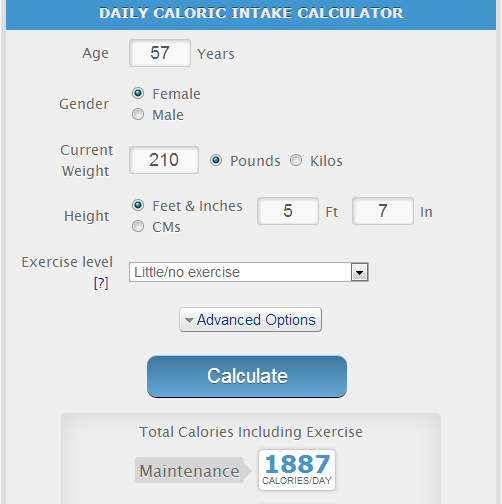 This math brings us to around 1400 calories per day, which for the moment, is what we’re experimenting with. If we find that this number feels too low by week’s end, we’re absolutely going to increase moving forward. Please note that I would not go lower than 1400 for Mom, nor would I recommend anyone dipping below 1200 calories per day. If and when Mom feels comfortable starting an exercise (walking) routine, we can see how her needs change and adjust if necessary. If you’re curious about my thoughts on calorie counting and why I believe in it so strongly, see this post. Cereal is kind of Mom’s thing. Her list of dislikes limited our options. No eggs, no yogurt, no banana, no blueberries. Still, she needs something that is convenient and easily transported, doesn’t require much prep work, and can be eaten quickly at work. Cereal, for now, it is. The night before day one, she asked me, “Can I have Frosted Mini Wheats tomorrow?” while eyeing the unopened box she had in the cabinet. I thought on it, knowing that, though completely delicious and fairly nutritious (say what you will about sugar, GMOs, and chemicals), the serving size would be small for the amount of calories she’d be consuming. I looked at her, hope in her eyes, and smiled. “OK,” I told her, hoping that this might be our first lesson: moderation. Together, we poured a serving into a Tupperware container for the next morning’s workday. “It’s small,” she said, looking down into the 200 calories worth of 22 frosty squares. In a separate, plastic sealable jug, we poured the milk—8 ounces of 1%. Even then, screwing the cap on the jug, I worried she’d find herself hungry mid-morning on her first day, and hate the plan. But then, perhaps, I thought she’d realize something about making choices—that sometimes the important thing to consider is not simply tastiness, but what will keep you satisfied the longest. Or maybe I was thinking it all over much too much, and she wouldn’t learn anything other than that Kellogg’s should really come down on those calories, man. The worry wart in me went to the store the next day and found her a new cereal—one that would allow for a larger portion. 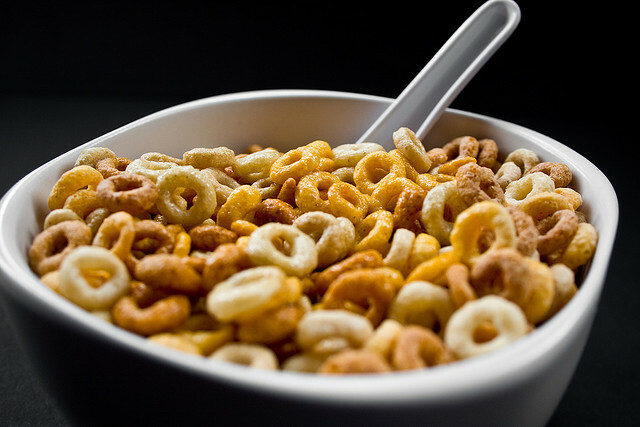 Knowing that she likes Honey Nut Cheerio’s, I found an organic, natural substitute: Cascadian Farm Honey Nut O’s. 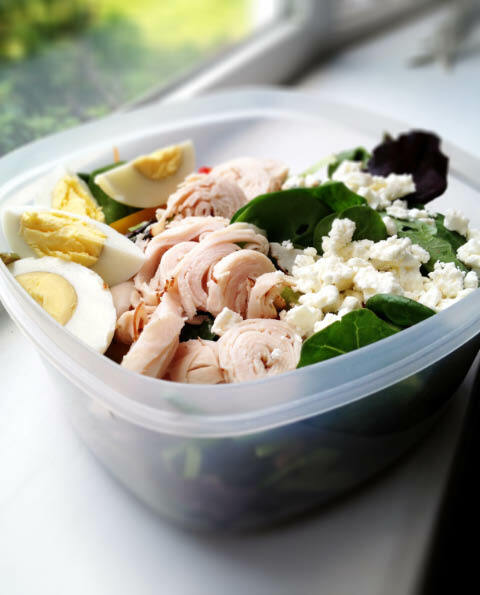 Lots of vegetable-heavy and lean-protein-packed salads. 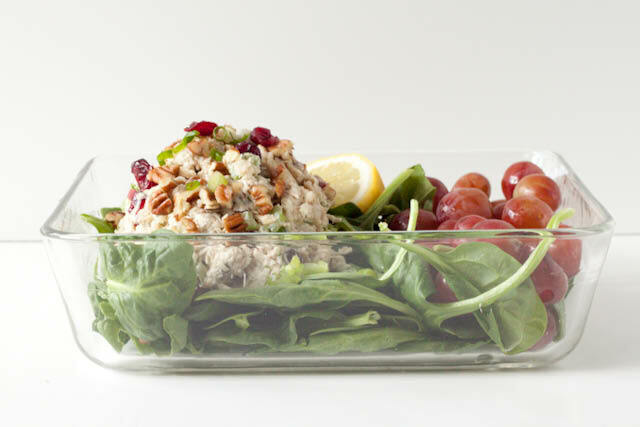 See this post for how to assemble a 400-calorie salad. Recipes for more of them, along with wrap sandwiches and a new feature on “packed lunches” to come. Snacks, at 200 calories, should have staying power to get Mom through a long afternoon. 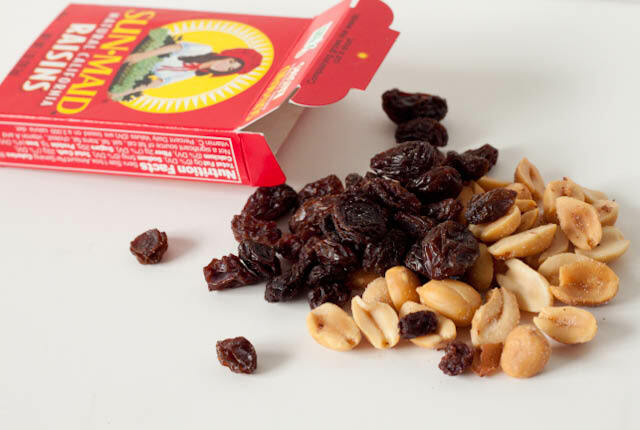 Nuts and dried fruit, as seen above, have the right balance of healthy fat, protein, and carbohydrate to keep her energized between lunch at 12:30 and dinner at 6:30. Now, even knowing the satisfying nature of nuts, I tend to think they’re a challenge on a diet since the portion is so tiny given how calorie-dense they are, but this has been a favorite of Mom’s so far. I have to wonder if it isn’t mostly due to the raisins, which are super sweet. Have I mentioned that Mom has a sweet-tooth the size of Texas? (Thank you, genetics, for that). I’ll share more of her snack options in the weekly recap post to come. Dinners are the biggest of the day, which is how Mom and I have always operated. We look forward to dinner; we plan our day around dinner; it’s an event. Making it the largest meal allows her to eat a wider variety of things—for instance, those foods and recipes that are higher in calories—and also ensures that she’ll feel full until bedtime. If a dish that I add to her meal plan has less than the 400 to 500 calorie quota, Mom is including a hearty vegetable side: roasted broccoli, steamed green beans with slivered almonds, grilled asparagus, salad, etc. 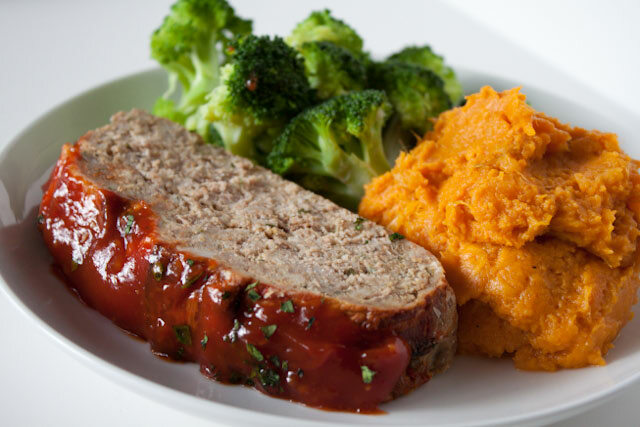 For more reading on bulking up your meals with vegetables, see this post. I will be sharing more of the dinner recipes (the exact ones I’ve used) in this week’s recap and in future posts. 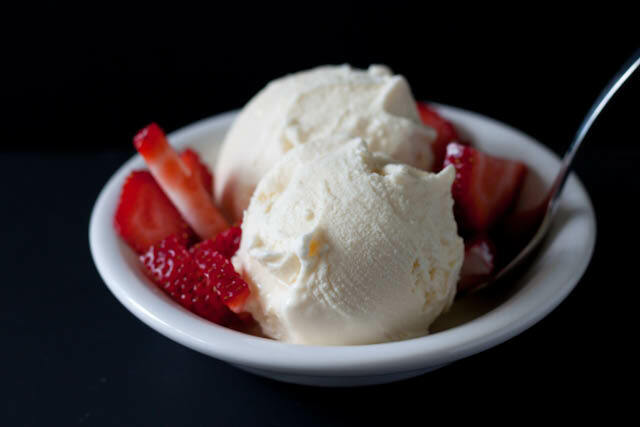 Dessert is something we haven’t tackled yet, since Mom has told me that after dinner each night, she feels full enough to forgo it (what?!). However, I have allotted some calories for a nighttime snack, should she need it. 100 calories are guaranteed, and she can add an extra 100 calories (for a total of 200) if dinner happens to be only 400 rather than 500, which is likely to happen with some of the meals that I add to her meal plan. Sweet options and ideas to come! So there we have it. 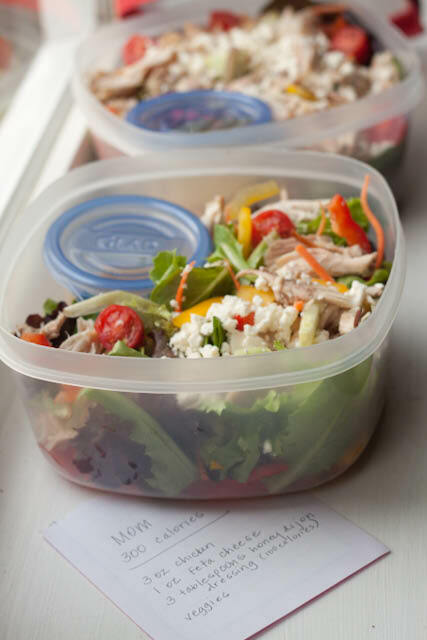 On Monday, I’ll post the exact meal plan that Mom followed this week, day-by-day, meal-by-meal, and we’ll share Mom’s own thoughts on how things went. What a wonderful thing for you and your mom to work on. Wish her luck and happy eating from me! This is amazing! It’s so great your mom is taking steps to help her health. I wish my Dad had taken steps sooner… he was trying, and going to the gym to swim, but he still thought a salad for lunch meant pizza for dinner :\ When he died we found so many fast food cartons and unwrapped hostess packages that I just stared and cried. I meant to say we found the fast food flotsam and jetsam in his car. Piles of it. I am so excited for your mom – the recipes look delicious and easy. Very cool that you are working in this together. Good luck to both of you! Bravo to you and your mom!!! Just found out my husband is having some issues with weight ( I thought he was just a bit round but nothing bad, apparently the doctor thinks different ) so I need ideas to slim the old man down. Beer is a good friend of his and they hang out a lot so I hate being the heavy and will have to terminate their long time friendship. I too can use a bit of weight loss and will probably feel much better health wise for doing so. Again my best wishes to you and your mom for taking this journey together. Your mom is a very blessed woman having such a wonderful caring daughter like you. Thank you, thank you, thank you! I’m around the same age and in the same boat as your Mom. I’m following your posts with great interest. What you said about making your own choices down the road makes sense but I am so thankful that you are posting suggestions right now. As a wife and mother, and “fat lady”….I can relate to your Mom. I too work two jobs, sixty-five hours a week, and have a family to feed. Although, really, they can fend for themselves. Please continue your posts on this plan. Not only will you be coaching your mom…but myself, and probably a lot of others too, and I can say, I appreciate the assistance!! I need the help. I will adapt your plan to likes/dislikes. I am not a vegetable lover, but there isn’t really a fruit I won’t eat. Thank you again for the inspiration to better my life. You are a rockstar! I’m sending this to my mom and hoping the two of us might consider trying out your wonderfully reasonable plan to lose weight. I love your blog. I love that you talk about food like a non-dieting, non-half-the-size person you used to be. So many who have accomplished what you have don’t ever return to real life eating and enjoying food once they are at a healthy weight. Thanks Andie! An answer to my prayers! in thinking why my scales have not budged – I was thinking of my calorie intake and not enough. in the south just too hot and too tired to fix for just me. I am changing that today and here’s my commitment: 5’7″ – 167.5….I have not said my weight out loud for years. Keeping this post in my inbox to be my encouragement! hope to update next week with lower numbers! Can I kinda adopt you!?! Great plan Andie. Why she does not like Mackeral I don’t know. It is one of the tastiest fish you can eat. Maybe you have to come with a good way to make it. :-). And give her some of the Ceylon Cinnamon Tea I sent you. It will clear up all all the bad bacteria in the stomach first. Love your diet plan. What you are doing for you Mom is wonderful. I have been on diets all my post-baby life. I would not lose weight on 1400 calories. Currently I am doing My Fitness Pal and am limiting my daily intake to 1000-1200 calories per day. Even exercising 3x a week (3 miles on the treadmill each day), I can only lose about 5 pounds a month. Discouraging, to say the least., especially since I eat very healthy, high fiber, mostly organic food, and a rare sweet treat. Cinnamon Vogue, thank you for the tips on apps. I think my metabolism died somewhere during my first pregnancy. I see skinny women at work who appear to eat twice as much as I do. I do take a thyroid med but it doesn’t seem to perk up my metabolism. I’ve lost 35 pounds since October and have about 50 or 60 more that I’d like to lose. I don’t like Weight Watchers because lately it seems that they are promoting a lot of their own food-like substances or other packaged products that are loaded with artificial crap and chemicals. This is awesome! Calorie counting is so wonderful, but it was definitely eye-opening in the beginning, when it came to portion sizes. Your mom is gonna rock this! First time poster here just stopping by to say..your mom looks YOUNG and AMAZING for 57!! Five kids?? My two little boys are aging me at 39 and I don’t know how she’s managed to still look so young! She is nothing short of amazing for “putting it all out there”. Good luck and I will be along for the ride, as I am trying to find ways to incorporate more veggies in our diet. P.S. your writing style is so unique, captivating and just amazing on all levels! Hey everyone. I have started a new blog to document my weight loss journey, and I’d love if some of you might check it out. I am completely new to the whole blog thing, and I just started it so it’s not great yet. I’m hoping to make it great along the way. I have been so inspired by everything I’ve read about Andie and her journey, and I hope that I can succeed at making my lifestyle a healthier one just like she has. It would mean the world to me if you checked it out and followed me along on my journey. So happy about this new series. Your weight loss posts are my favorite. What a wonderful post. It is something that I have been looking for. A realistic approach to losing weight. I swear your mother and I are the same person, although I love all fruits and veggies. Yogurt and eggs not so much so it’s wonderful that she can have cereal for breakfast (that is me to a T). I look forward to following your mother on her journey as well as becoming an active participant. I used to be a runner (not very good, but I loved it) until I developed a bone spur 2 years ago. I finally had it removed but had to cut my achilles tendon and I am recovering, resulting in a 30 lb weight gain over 2 years. I am now getting back to the gym to exercise and am so excited and determined to get back to my running life. Andy I hate to tell you this but I’m going on your mum’s diet. You my little angel are a godsend. I relate to a lot of your mum’s lifestyle (working six days per week, I have 3 kids under 12, etc) my health and weight is a constant in my life and I don’t want it to be. I’m working on printing off all of your recipes and putting them in a recipe box ~ i have to adjust a few items as we don’t have them here in Sydney Australia but I hope that I can continue this journey side by side with your mum. I love your blog, and your story and it gives me lots of hope. This is awesome! Besides the age difference, your mom and I have the same stats. I’m about 16 years younger. But I will definitely be trying to learn some things right along with your mom! Fantastic post! You’re doing a great thing for your mom. I’m working on an eating plan for myself to finally take the weight off, so I’m really looking forward to your posts! Your mom is so brave by letting you put this out there!! So great that she has such support, that will help her be amazingly successful! Go Andie’s Mom!!! Looking forward to the diet diaries to come! I hate mackerel too. Any other sushi I love but not macherel. Will be following your mum’s journey from Australia :) look forward to witnessing her amazing achievements! i’m really digging these posts! it’s so interesting to finally see someone work out a healthy / diet meal plan for someone that is less interested in fussing over perfect ingredients or caring about organic. like you said, any step in the right direction is a great step. it makes me hopeful for helping my own mama someday. That is very sweet of you to help her like that. All that food looks so delicious too, so she is very lucky! everyone must have a daughter like you !!! Thanks for not only posting what your mom is eating and the recipes, but the WHY behind it. I am a picky eater with some food intolerances, and have been struggling to find a balance between what I LIKE to eat and what I CAN eat. With a little extra work (and math– yuck! :) ) I think I can use your tips to make a plan and hopefully see the success! Oops, this comment was meant for the next post! I’ll copy it over there as well. I will add that this is an excellent plan and that this is a lovely thing you’re doing for your mom, Andie! Go Mom !!!!!!!!!!! You are a good daughter to help her and she is a good mom to listen to her smart daughter on weight loss. Looking forward to recipes. I absolutely love your blog! You are an amazing inspiration and I’m planning to start my healthy eating plan on Monday, based on what you have done for your mom! I just wanted to ask about liquids – what would you say to tea, coffee etc. I love water and hardly every drink soft drinks, but I do like a coffee or tea at least once or twice during the day. Is this something that can fit into this eating plan? As far as Mom’s liquids go, she’s only consuming zero-calorie drinks. She’s never been a coffee drinker, and she really doesn’t like tea. The only thing that took a bit of time was switching from regular soda to diet. She was a Coke drinker for most of my life. Now, during the day, she drinks water–usually mixed with those little single-serving Crystal Light packets (raspberry lemonade is her favorite). At night, when she gets home from work, she drinks a 12-ounce can on Fresca with dinner (it’s a diet soda that tastes like grapefruity Sprite if you’ve never had it) and maaaaybe she’ll have another one after dinner, too, but not always. For you, if you like tea, I’d say to try to slowly eliminate the sweeteners in it (if you use any). If you use milk in your tea, I’d say that’s fine–it’s likely such a negligible amount anyway. As far as coffee goes, I’d pull back from using cream or anything like Coffeemate creamers slowly, because generally those pack about 30-40 calories per tablespoon, which can add up to 100 calories in no time at all if you have more than 1 cup of coffee a day. I, as you might know, am a huge coffee drinker, and have come to love using almond milk in it (Almond Breeze unsweetened original or unsweetened vanilla–both have 30 to 40 calories per cup). If you’re not into almond milk, try milk–1% is great at 110 calories per cup. And as far as sweeteners/sugars, it will depend on your tastes and the amount you want to use. A teaspoon of sugar will only add 15 calories, so that’s not too shabby, but you could also consider something like Stevia, which is 0 calories. Wow Andie, thanks for taking the time to reply! Wasn’t sure if you would – I know how busy you are! I am from South Africa so a few of the product names you mentioned are foreign to me, but I get the idea, thanks so much. I started the plan on Monday and am loving it so far. I have lost 1kg (2.2 pounds) so far and hopefully I’ll have a good week and good number at the end of the week. I am planning to run my first ever 4km (2.4mile) trail run next weekend and then aiming for a 5km charity run in October. Thanks for being an inspiration. I hope to be an inspiration to others too. I was not always overweight, only in the last few years since my daughter was born. I’m similar age to you, so your story and blog definitely inspires me! I kind of forgot about your blog (shame) and just rediscovered it today…. catching up on your mom’s journey. Thanks for sharing this… my mom has been asking me to do the same thing for years. I’ve been stalling, but maybe I can be brave and follow your lead. It’s a scary thing, you know?? My own daughter just sent this to me. Like your mom I’m 57 years old- 160 pounds but only 5″ tall. Katie has lost 45 pounds and I asked her to help me. I love cereal and sweets like your mom so think your suggestions are something that might help me as well. thank you and keep posting. Your mom is as lucky as I am. That is exactly what I was looking for!!! I was searching healthy meals within the taste range of my picky eater husband and I stumbled upon your wonderful blog (while searching for carrots, peas, potatoes and steak image! lol!). Bless you for what you’re doing for your mother and your sensible approach to dieting. Keep up the good work and thank you for the inspiration, recipes and tips! What a cool thing to do for mom. When it’s easy and taste good, I think I could actually stick with it too. Good job! Both you and mom. Pingback: Happy Holidays! | Can You Stay For Dinner? This is the only one system that will give you individual diet plan.It is 100% natural and healthy.I’ve tried this system and saw immediate results in less than a month. Love your blog. I don’t follow many diet blogs but love yours. I am nearly your mom’s age and my mother is visiting and has battled weight all of her life. Having a little knowledge (which can be a very dangerous thing) of nutrition and with a plan to take a month off here shortly, where I will have more time to visit my mother. I’m thinking that not only will she and I be able to sit down and devise an eating plan for her, but also, my older sister and I can do the same thing! Thank you again for your very helpful blog! Hello I’m following your posts with great interest. What you said about making your own choices down the road makes sense but I am so thankful that you are posting suggestions right now. All that food looks so delicious especially Dinner, so she is very lucky! So awesome that you are working with your mom…… wish i had someone to work with one on one like this!! Congratulations So pretty before and after. I bought the Cascadian Farm Organic honey nut O’s and they are delicious. Add some almond milk from Trader Joe and some blueberries…yummy. Thank you for referencing them.